2019 The Taxidermists' Woodshop Catalog. 31pgs TTW Poster Dim. 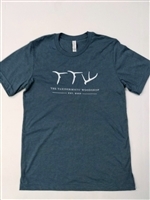 11x17 These super soft blue TTW t-shirts are made from 55% cotton/ 45% polyester and are pre-shrunk. Available in medium, large, and extra large. 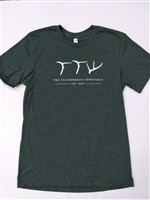 These super soft green TTW t-shirts are made from 55% cotton/ 45% polyester and are pre-shrunk. Available in medium, large, and extra large. The Taxidermists' Woodshop Hat, Olive and Khaki, Garment Washed Twill. Adjustable back, one size fits most. The Taxidermists' Woodshop Hat, Weathered Brown Cotton Twill. Adjustable back, one size fits most. The Taxidermists' Woodshop Hat, Weathered Brown Cotton Twill front with Mossy Oak back. Adjustable back, one size fits most.